There's no getting away from the fact that the iconic Beetle has evolved, but the latest iterations still maintain the model's distinctive exterior styling, sense of fun, plus a refined interior. 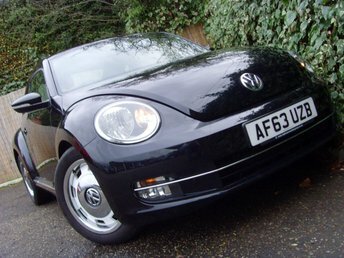 If you'd like to explore the full range of used Volkswagen Beetle models for sale in Norwich, be sure to pay us a visit. Here at Vulcan Motor Company Ltd we're dedicated to offering excellent customer service and we'll go the extra mile to help you find the right used car to suit your requirements. Get in contact with a member of the team today to discuss your needs in detail and to arrange a test drive in the car of your choice. Finance is available to UK residents aged 18 years or older, subject to status. Terms & Conditions apply. Indemnities may be required. Other finance offers may be available but cannot be used in conjunction with this offer. We work with a number of carefully selected credit providers who may be able to offer you finance for your purchase, commission may be received. We are only able to offer finance products from these providers. Postal Address: Vulcan Motor Company Ltd, Vulcan Road South, Norwich, Norfolk NR6 6AE. Find contact details here. Vulcan Motor Company Ltd is authorised and regulated by the Financial Conduct Authority, FRN: 664660. All finance is subject to status and income. Written Quotation on request. We act as a credit broker not a lender. We work with a number of carefully selected credit providers who may be able to offer you finance for your purchase. We are only able to offer finance products from these providers.